According to the American Association for Marriage and Family Therapy, almost 40 percent of new marriages are at risk of ending in divorce. In an attempt to reverse this trend, several state and local officials are increasing their efforts to prevent divorces. One such measure is a requirement that couples attend pre-divorce counseling. Currently, the following states require couples therapy prior to divorce: Washington, Oregon, Missouri, Mississippi, Minnesota, Michigan, Maryland, Iowa, Illinois and Arizona. Divorce counseling can help unhappy couples figure out whether their marriage is salvageable. In the event that a divorce appears inevitable, therapy may aid couples in working out their divorce agreements in a peaceful manner and may help the non-initiating spouse come to terms with the impending dissolution of the marriage. Should Pre-Divorce Counseling be Mandatory Nationwide? There is evidence that certain kinds of marriage counseling can help to improve marriages. For instance, the Chicago Center for Emotionally Focused Therapy, cites research that indicates around 50 percent of couples who participate in emotionally focused couples therapy have improved marriages after completing the program. Around 70 percent of participating couples report improvement within three months, and after two years, couples had retained the improvement to their marriages. These statistics may be misleading when considering mandatory counseling because couples who voluntarily seek counseling may be invested in salvaging their relationships. When couples have already taken the step of filing for a divorce, one or both of the partners may be unwilling to consider reconciliation. This fact may significantly reduce the success rate of mandated couples counseling. Critics of mandatory pre-divorce therapy have raised some concerns in light of the recent steps by some state governments to pass such a mandate into law. One such concern is that the mandate would usurp the role of individual judges who frequently order pre-divorce counseling at their own discretion. Judges may be better suited to decide whether a couple is likely to benefit from counseling. For example, if a marriage is ending due to domestic violence, counseling might not be appropriate or beneficial to either party. 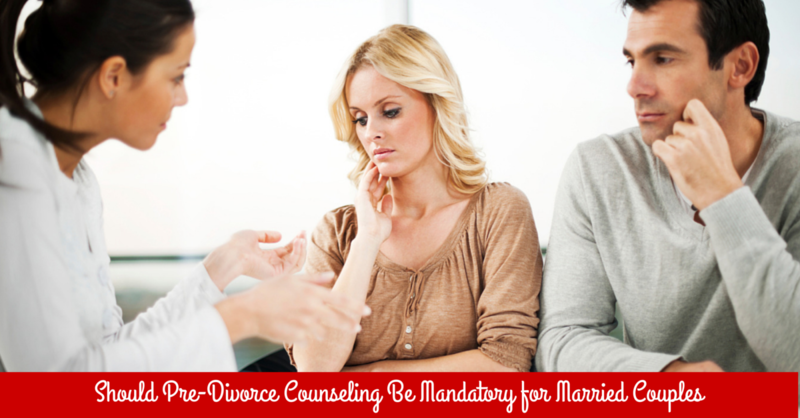 Other critics have expressed concerns that individual constitutional rights may be violated because mandatory counseling would create barriers to divorce. For example, if a state requires the couple to pay for therapy out-of-pocket, then low-income couples may not be able to afford to get divorced. Some therapists are also skeptical of the mandates because – while they believe in the potential benefits of couples counseling – mandated counseling typically requires only a few hours of therapy, which is often not enough to make significant progress. Many counselors set up goal-oriented therapy with a set amount of time to accomplish the couple’s goals such as saving the marriage. Couples should have realistic expectations about marriage therapy. Many marriages take years to break down and so it may take months or years to make real progress in the repair work. When both spouses genuinely wish to repair their marriage, counseling can help couples create realistic goals for their relationship, such as more effective ways of communicating with each other and how to create a safe space to express feelings. It is important to note that the couple should not expect to avoid any conflicts in the future. Many therapists believe that the occasional conflict is an indication of a normal, healthy relationship. While therapy can help to improve the marriages of couples who want to save their marriages, many sources suggest that counseling may not help governments lower divorce rates. One critic of mandatory pre-divorce counseling has suggested that it may be more beneficial for legislators to consider factors that may reduce marriage rates and increase the number of divorces. For instance, financial troubles can keep people from being able to marry and can also put pressure on couples who are married. Focusing on an improved economy might help to bolster the number of married couples.